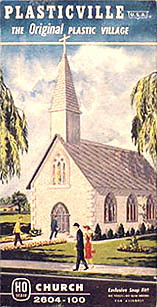 This was the first church released by Bachmann. Collectors are unsure of the year of release. The generally accepted date is 1950, but it is possible that the "Build-a-church" version was released a year earlier. Bachmann would glue the doors and windows in place at the factory and collectors are always looking to find one that has the least amount of "yellow" glue stains. These stains are visible around the windows and doors to the left. This church came in two different color varieties, WHITE walls with either a BROWN or GRAY roof, door, and windows. This church was first available in 1950. Sometimes called the "Country Church" to distinguish it from the CC-7, this church boasted the addition of a belfry, and was available in the same color combinations as the No. CC-7 Small Church. This is the part that is most often missing from this structure. A GOLD version, illustrated to the right, of this cross was included in some of the No. CC-8 Country Church kits. The WHITE cross, illustrated to the left, is available as a reproduction part, but the GOLD version is not. This is the part that was added to the CC-8 steeple and defines the difference between these two churches. It has not been reproduced. There is a variation in the size of the front door on these churches. The large door is shown in the far left illustration, with the small door version to its right. This small door variety of this church has been attributed to the HO Scale release of this structure. Because all of the other parts of the HO kit are the same size as the O-S Scale church, it has been included here as a viable variation.